With his adaptation of 'Fiddler on the Roof' from the successful stage production to the screen director Norman Jewison executes at once, a thrilling and extravagant musical in the grand old ways of studio Hollywood, as well as, using the context of the impending Russian Revolution, a sombre reflection of how the march of time can quickly erase centuries-old traditions and history. As proclaimed in the opening musical number, the film is about 'tradition'. The family traditions of Tevye’s people, Ukrainian Jews, who for centuries have done things a certain way, the duties of the family set out and adhered without question. Like the grass is green so are the traditions of the Tevye’s life. And so when his three daughters, all of whom have entered marrying age, one by one choose the modern version of courtship over the traditional arrangement, Tevye's life comes crashing down. The narrative structure coincides with the romances of each of the three daughters. There’s the eldest daughter, Tzeitel (Rosalind Harris), who is set up with an older widower because he has money. But the young gal is clearly in love with the lowly tailor –a fact which everyone in the town knows except Tevye. Adding fuel to Tevye's fire is the second daughter Hodel who shacks up with the local Marxist Perchik. And much as Tevye is a man of principle and tradition, he can't help but give in to their demands. But the last straw is Chava (Neva Small) who elopes with his Russian Orthodox beau, which causes Tevye' to put his foot down on faith and disown his youngest daughter. At three hours its long and indeed the two hours before the intermission fly by with lightning speed. Arguably the final third is a different film. As the parallel story of the Russian Revolution catches up to Tevye, the film turn serious with a very dark dose of new century reality. Not only are Tevye's traditions crashing down but his entire way of life will be instantly thrown upside down. As Jews, they will be thrown off their land, and presumably later in life, suffer even worse fates. As the anchor, Topol is magnetic. The Irsaeli star appeared in the London production and in the film version was nominated for an Oscar. Topol exudes great strength as a father, as well as a vulnerable emotional side when his traditions are challenged by his daughters. Jerome Robbins choreography, like his other great cinematic ventures, West Side Story, Seven Brides for Seven Brothers and the King and I, is rooted in the reality of the story. Unlike the fantasies say Gene Kelly, Robbins' sequences don't so much provide audiences with imaginative escapism but distinct expression of the emotion and action of its particular scene. For instance the great wedding scene at the end of the second act, features a number of precise dance numbers, all of which are organically tied to the traditions of the event. One of the more ironic stories to emerge from the making of this film is contained in the introduction to Norman Jewison's book 'This Terrible Business Has Been Good to Me". In it he describes the inadvertant error made by the studio in their decision to hire Jewison, based on his name. 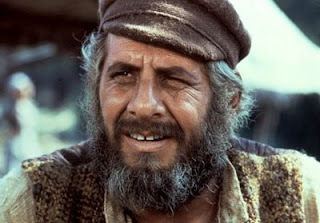 Well, despite his name Norman Jewison is not Jewish, yet he still delivered a great Jewish movie and a timeless classic.